Those nice people at First (bus) sent me an email today telling me about the launch of their new smartphone app. This launched nationwide today after being trailed in Hampshire. It is available for both Android and iPhone. The app for Blackberry and Windows phones is still being developed. I quickly downloaded the app to see how good it was to use. And I will say I am very impressed on how it works including the layout of the app. It easily shows you time-tables, routes, fares and locations of bus-stops. It informs you of service updates and other travel related news. It also supports Real-time Passenger Information (RTPI) in those areas which have that facility. All in all it is well worth downloading especially as it is free! So well done to First on launching this app, it certainly make it easier to catch a bus. I just wish catching a bus was a lot cheaper than it currently is. You will more than likely be in for a treat of two blogs today on the budget meeting at Cornwall Council. The first one will be on my amendment to reduce the Leader Contingency Budget in the 2012/13 period from £600,000 to £250,000. Currently it is set at £1 million. My amendment would transfer £175,000 to the transportation (buses) budget and the same amount to public toilet funds. I believe these two areas are under huge budgetary pressures. You only got to look at the recent outrage when 114 toilets were earmarked to lose their funding. Bus routes are also under threat with the reduction to the amount paid by the council to the bus companies to help pay for concessionary fares. (reduction from 75% of the cost to 50%). The overall budget bus budget is likely to be reduced from £3.9m to £3.1m. This will have an affect on bus routes. I blogged about some of the areas this money has been used HERE, but is it right this budget funds the Tall Ships race £100,000? Or the Local Enterprise Partnership Board (LEP) to the tune of £40,000 for travel expenses, subsistence and the Chairmans honorarium? Surely the latter should be funded out of the LEP’s own money and the former out of the economic development pot. Other areas funded are establishing a Cornish Focus Paper (Census) to the tune of £20,000, or the Olympic Torch for £80,000. It is not that I am against some of this funding or the other areas already funded (but I have not yet listed), but the budget could be used better. Hence my amendment. As for the vote, my amendment was narrowly defeated by 51 against, 47 for. It was interesting to note that the entire Conservative party present voted against this proposal. I shall be reminding them when they complain about cuts to these services for lack of money, when they had the chance to put in more money into these two areas. Still only losing by 4 votes shows many believed in what I was trying to do. I was invited to attended a meeting at Truro College with Cornwall and Devon First Bus Group. I was not alone, as the other 122 Councillors of Cornwall Council were also invited to attend this event. Sadly, only three other Cornwall Councillors did indeed attend. Pretty poor showing, but First do not cover all areas of Cornwall. I really feel those Councillors who choose not to attend really missed out as First had their entire regional management team, including the MD present. With so few Councillors there it gave the four of us the chance to have a real one on one discussion with the First management team. It is not often you get the chance to discuss strategic and local issues with those who set policies and help run the company. It was great to hear where the company wants to be in the next few years in Cornwall, and how it wants to improve services and the experience of travelling on the bus. Contactless ticketing (like the Oyster Card in London) is one of those areas that will be introduced in the next year or so. 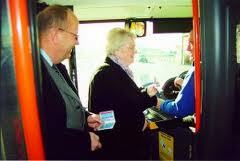 Currently all the ticket machines in First’s buses are being upgraded to allow this technology to be used. Wifi is also a possibility on the main commuter routes. This is currently being trialled on the Cardiff – Swansea route. So far, this is really working and the MD said he hoped to roll it out to other areas. I made the point the cost of tickets puts many people off; especially for families. I asked why can’t children travel free if accompanied by an adult, or a like scheme that would help encourage families to use the bus. Also, more deals should be for those groups that receive no type of concessionary rates. Both these ideas received a positive response from the MD. Now I know he is not going to suddenly implement these ideas, but he did say this is something the company is looking at now. A real interesting idea the company is working on is some sort of mobile app/program that will give you a live update on where a bus is. So a quick check of your phone you will let know how far away the bus is, or if it is running a little late. This could reduce the time people wait at a bus stop. I really like this idea as I know from experience how much extra time you have to allow when catching a bus. The real surprise of the evening was when one of the finance directors came up to me and asked why Cornwall Council were not part of First’s business club promotion. I asked no idea, have you contacted the council? He replied he tried, but got the cold-shoulder from Cornwall Council. I said I would help out, but could you explain how the deal works. In helping those who travel a lot they can get a discounted ticket. For instance, an average monthly ticket costs £98 per month, but if Cornwall Council signs up for this (no cost to the council) a ticket can be bought by a council employee for a monthly cost of around £65; a saving of around 31% of the annual price. I feel this is a no-brainer for the council to sign up to this. I asked if Cornwall Council got a lot of people to sign up for this could a better deal be done. The chap from First choked a little, but then said yes, we can always talk about this. He also mentioned that he would love to offer this to RCHT, but like the council it is hard to get to talk to the right person. I said I will talk to those who deal with this, and today, I have done. I spoke to the Portfolio Holder this morning and his response was ‘were do we sign’. I believe if a bus was seen as a more clean and more pleasurable experience with decent and affordable ticket pricing more would use them. First is not there yet, but from what I heard and talked about I believe they are trying to get there. The Inquiry Day into Concessionary Fares, or to give its correct title of English National Concessionary Travel Scheme (ENCTS) was always going to attract a lot of interest, especially as any changes will affect many people. Any cut has the potential to affect not only to those who are entitled for free travel, but those full paying customers who use the buses because routes could disappear. Cornwall has the highest re-imbursement rate in England with £7.6m spent in 2010/11 period. The reason for the grant is not to subsidise bus operations but to pay for any increased costs that may have been incurred. There are 125,000 Cornish pass-holders and a further 500,000 visitors who are entitled to use this scheme each year. I asked the question to the bus companies present the percentage of tourist users, but they said they did not have that detailed information. However, they did say it equates to around to 25% of all journeys in the three month summer period. If we had more detailed information maybe we could lobby Government for some sort of dispensation. The bus companies are not only facing a potential cut from Cornwall Council because of a £2.2m shortfall in this year’s budget, but also from the Bus Service Operator Grant (BSOG). This cut could be up to 20% in 2012/13. Add to the pot the high fuel prices a lot routes could be in doubt. Bus companies could also do better by reducing their costs and making the services they provide more cost effective. One way they could do this is by introducing Smartcard ticketing which could enable them to recoup 8% and a further 2% if they have Automatic Vehicle Location equipment. During the inquiry there was a call for a nominal fee to be paid per journey, but this cannot be carried out as this would be illegal under the current Act of Parliament. This also rules out charging tourists to use the service. The scheme does not even allow for voluntary contributions from passengers. It was interesting to note that only the English scheme was valid in Cornwall with Scottish and Welsh pass-holders having to pay the full fare. The general message from all those Councillors present is there should be no dramatic cut in funding to the ENCTS. The big problem is where this £2.5m shortfall will be made up from? If it cannot be found within the Transport budget what other service would have to make the sacrifice? Many other Local Authorities are facing a similar dilemma to their ENCTS, and will no doubt be looking at Cornwall to see what we do. Let’s hope they don’t think car parking could take up this shortfall. There will be an inquiry day to look at Concessionary bus fares on the 19th August at County Hall, Truro. This is likely to be an all day event starting at 10 am. This has come about from a recommendation from the Environment and Economy Scrutiny Committee which took place on the 27th July. It is likely to be a lively affair and one I hope will be webcast due to the controversial nature of the subject.